One of the reasons I like living in a walkable suburb is because it slows the world down a little bit. And one of the best things about slowing down, is having the opportunity to linger. Lingering is not something you can do very easily in a car. (And if you do, you’ll probably hear about it from the car behind you!) But when you're walking, you can linger on the foot bridge over Edgemont Pond if you happen to see the white heron strutting near the shoreline, or you can linger in front of the Montclair Bread Company because it smells so dang good out there. 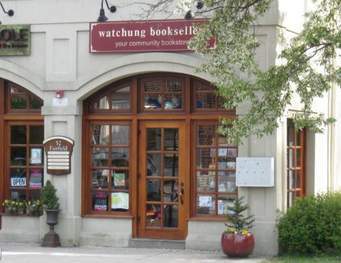 One of my favorite places to linger is Watchung Booksellers – and not just because it’s my neighborhood bookstore. It's just a delightful place to spend time. It’s cozy and unhurried. And everyone in there seems as if there’s no place they’d rather be. Add to that the fact that it's full of books and it just doesn't get any better than that. I came across a piece about Watchung Books on Facebook (another place I sometimes like to linger) and the writer summed up the vibe so well. I loved reading Thomas Pluck’s ode to my favorite bookstore. I liked the way he provided so much context for its existence, and how he, himself, lingered over details about our town, painting a picture that feels authentic and true for all of us that have made our home here. Maybe it’s just the sweet melancholy of autumn, but it’s been feeling especially good to me these days to slow down and linger.